i remember from my last visit here (July 2010) that getting a SIM card was not an easy task, so i was ready for some trouble. as you can see, i’ve run the gamut. tl;dr third company’s the charm. after trying Movistar and Personal, i finally have a fully-working phone via Claro. 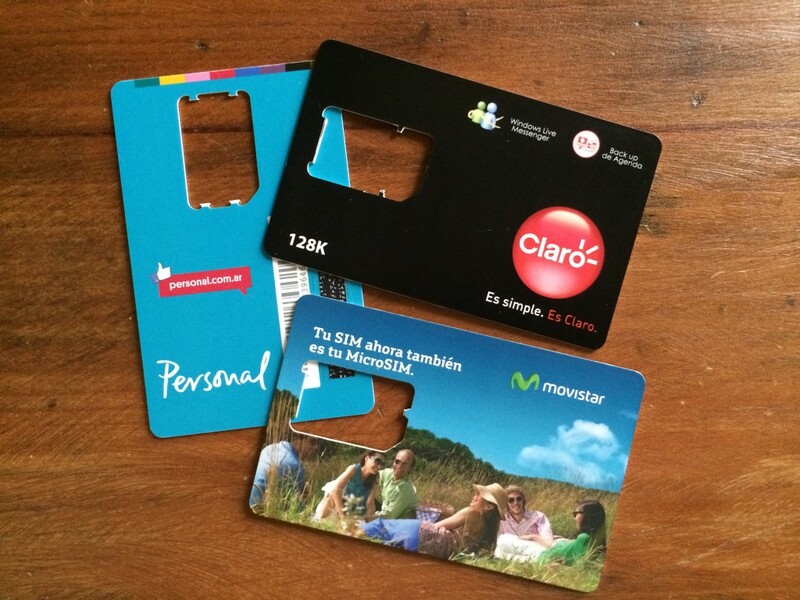 Claro was also the easiest to set up (no forms, no passport, in-store credit load), with Movistar being slightly more difficult (add credit at a kiosk, not at the store), and Personal being the hardest, with long lines and forms and red tape. NOTE that my troubles are not typical; others have reported success with both Movistar and Personal. scroll all the way down to read my success story, although you may want to go through the other sections since i detail the buying experience for each company (especially Personal, which is bureaucracy at its finest). 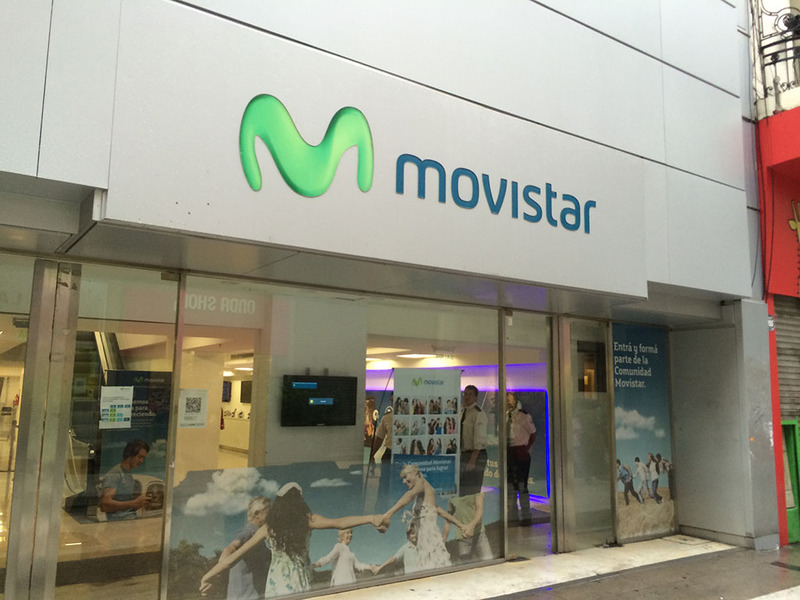 i got to the Movistar on the north end of Calle Florida (remember, in Argentinian Spanish, it’s ca-zhay, not ca-yay) 15 minutes before it opened (9 AM weekdays) and diligently waited outside since last time i was here, there was a long queue at the Personal store. 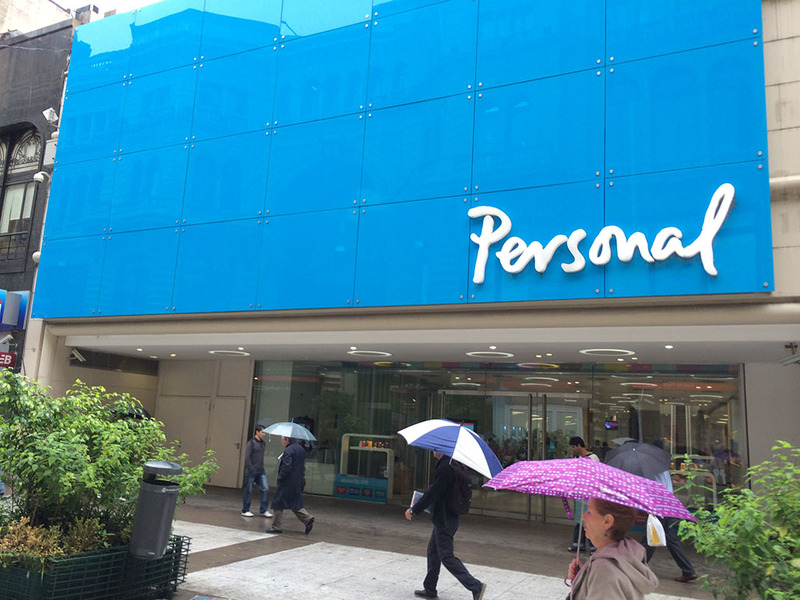 when it opened and i got inside, though, i was told that if i wanted a prepaid SIM, i’d have to go to the Movistar kiosk on the first floor of the Galerias Pacifico, which opened at 10. i didn’t have that long to wait, so i moved down the street to the Personal. moral of the story: don’t go to the main Movistar for a prepaid SIM. there were three other addresses on the little map i was given that would sell prepaid SIMs in addition to the one at the Galerias: Florida 524, Florida 373, and Av. Corrientes 536. Movistar was my first choice since i heard there is immediate activation, but i didn’t have time to waste (i had to get back for a conference call) and thus could wait for slow activation with Personal which i remembered from 2010. this wasn’t the Personal store i went to last time i was here, but it was a lot nicer (a block or so north of the Movistar on Calle Florida). the steps, though, were the same. SO DIFFICULT. when you enter, stop by one of the reception stands and tell them you want a prepaid SIM. they’ll take your passport and enter your name into the queue computer. wait in the waiting area until someone calls your name. the English of the people i spoke to today was decent enough, although it helps to know some Spanish, e.g., “tarjeta SIM” (SIM card), “prepago” (prepaid), “illimitado” (unlimited [as in data]), “¿es todo?” (that’s all? when you need to make sure you completed all the steps at your particular stop). someone will come out and call your name (they might use a number system when it’s more crowded, but this morning there were only a couple people waiting, so i didn’t have to wait long and they used names). follow them back to their cubicle. i told the representative i was only interested in data, and gave him my passport. he told me the SIM card would cost 10 pesos (~$1 US), and data would be 1.25 pesos per day for unlimited data (about 12 US cents per day!). after a long while futzing with the computer, he printed some forms and led me to stop 3. take your stuff with you; you won’t be coming back to his station. Apologies that it got so wrinkled! 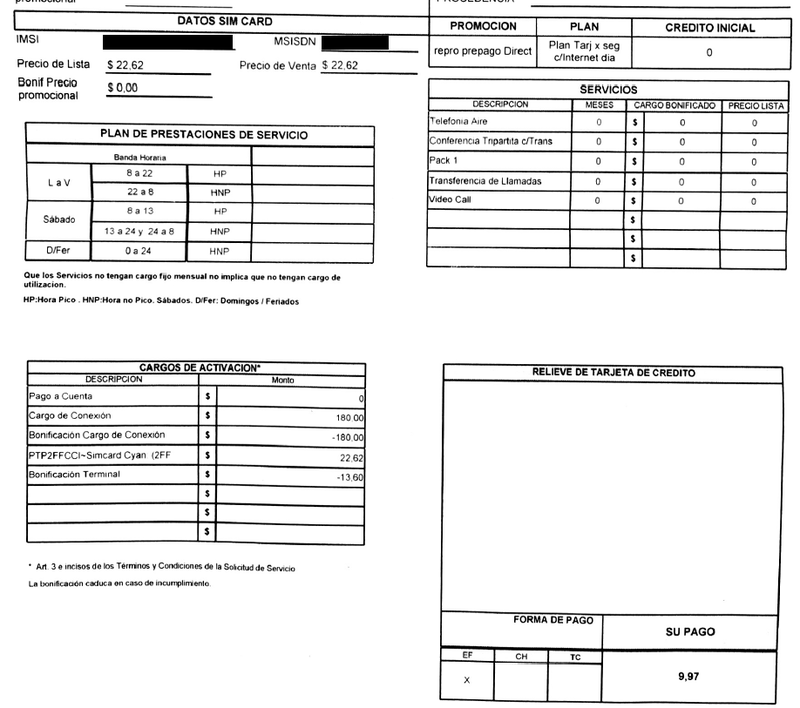 Note total amount 9.97, rounded up to 10 when you pay, and the PROMOCION and PLAN at the upper right. at the back of the store is the cashier. i tried to pay my 10 pesos with a 100 peso bill, but they didn’t take it (it’s really hard to get someone to make change around here!) so i had to use a credit card. yes, i charged a dollar to my Amex. :\ the cashier will stamp your form indicating you have paid. 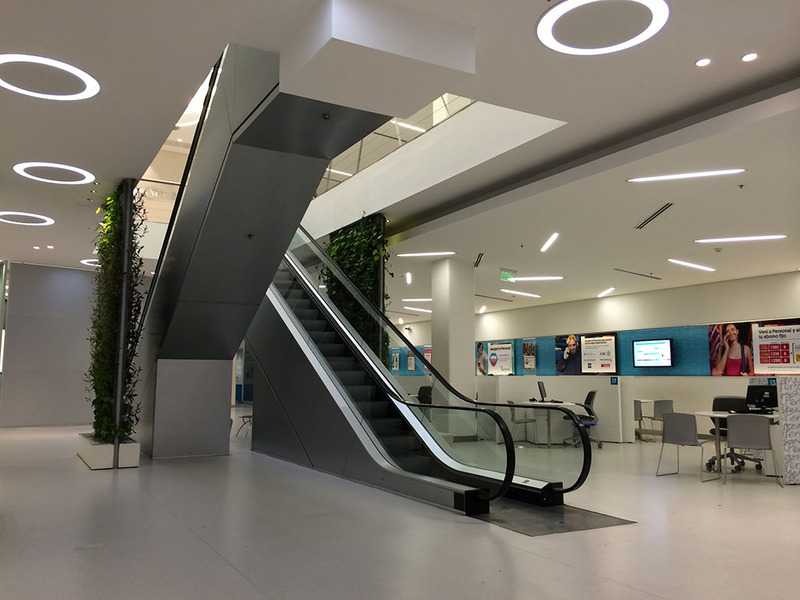 after payment, continue to the right and hand your forms over at the next counter where the employee will take them to a window and pick up a SIM card for you. he had a cutter and was able to cut the micro-SIM down to a nano-SIM for my iPhone 5S. you’re now the proud owner of a prepaid SIM! IMPORTANT: dial *188# to activate your SIM card. (i’ve been waiting around for hours for it to autoactivate when i saw this on the back of one of the brochures that came with the card.) activation was immediate after this. i don’t know why they can’t top up a card when they sell it to you, but no, you have to go to a convenience store (e.g., “Open 25 Hours” [yes, 25]) and use one of the kiosks there to add money to your account. in 2010 you could go to any of the newspaper stands in the street buy a scratch-off card with a PIN you texted in to add credit, but it seems that it’s now all electronic. on the kiosk, choose “recarga prepago” or “recarga cellular” and then your network (in this case, Personal). enter your phone number (look for the number next to “Linea” or “MSISDN” on the forms you got from the store — it should be 8 digits long) and how much you want to reload. note that for Personal the minimum is 20 pesos in cash only, and it does NOT give change. you may also be able to reload at the cashier at a convenience store, but with a convenience charge (~1 peso). sidebar: Personal Wifi even with my broken(?) SIM card, i’m able to sign on to Personal Wifi hotspots located around the city. you will need to set up a PIN code which you can either do on their website (when you create an account) or by dialing *CLAVE (free) on your phone. i went to the kiosk at Galerias Pacifico (when they say first floor, they mean the top floor) and got a SIM card there. super easy, although again, the man did not speak English (you shouldn’t expect people to, even in the touristy areas). he didn’t even need a passport and he had a SIM cutter to get me a nano-SIM. long story short: activation happened within 5 minutes, automatically. he told me internet would cost 1 peso per day, but i had no internet, even after getting a message saying i was automatically put on that plan. i tried buying internet packs (send INTERNET to 2345) and got confirmation they were activated, but still, no connectivity. i have the 3G indicator, but no service — everything just times out. note that for both Personal and Movistar i tried every combination of APNs at unlockit (which you shouldn’t have to do, but i did just to be thorough). I GIVE UP! i’ve sunk enough money into this endeavor ($15 maybe? lol). i shall (*gasp*) live without! ok. i lied. i had to give it one last shot. I got there at 10:15 and waited for 30 minutes for someone to show up (no one did). Finally went back a couple hours later. i’ve seen reports of Claro not working well, so i saved it for last. maybe i should have tried it first. i went to the store on Av. Santa Fe a couple blocks east of Av. 9 de Julio and got a SIM card for 20 pesos ($2). like Movistar, it was really easy with no forms and no passport required. i told the man i needed internet for 5 days and he told me to load 20 more pesos on (which gave 40 pesos of credit total due to a promo?). activation was immediate, although data took about 5 minutes to start working. he was able to do the reload at the store, too! no need to go to a kiosk! just be warned that he does not speak English, so you’d better brush up on your Spanish. if i can do it, so can you! oh, i tried to add a 5-day internet package as described on the Prepaid with Data wiki page, but it says i already have internet (which is true). i hope it’s not the type that’s throttled…i’ll report back if it is. update: indeed you are limited to 10 MB at full speed, at which you get throttled to super-slow. 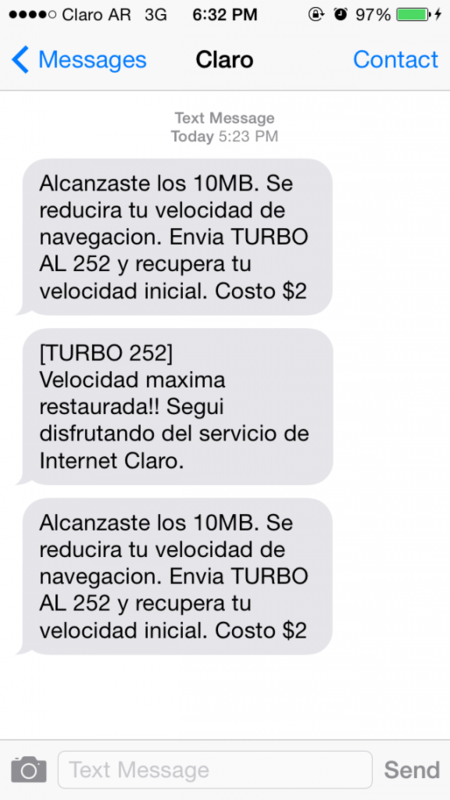 you get an SMS saying to get back to full speed, send TURBO to 252, costing 2 pesos (~20 US cents). for simple tweets and emails, the slow is definitely OK, but if you’re going to be sending lots of images, you might need to upgrade. Internet: Precio nominal de $2,50 por día, bonificado hasta el 28/02/2014 a $ 2,00. Duración hasta las 23:59 hs. del mismo día. Velocidad hasta 10MB por día, luego 64Kbps. 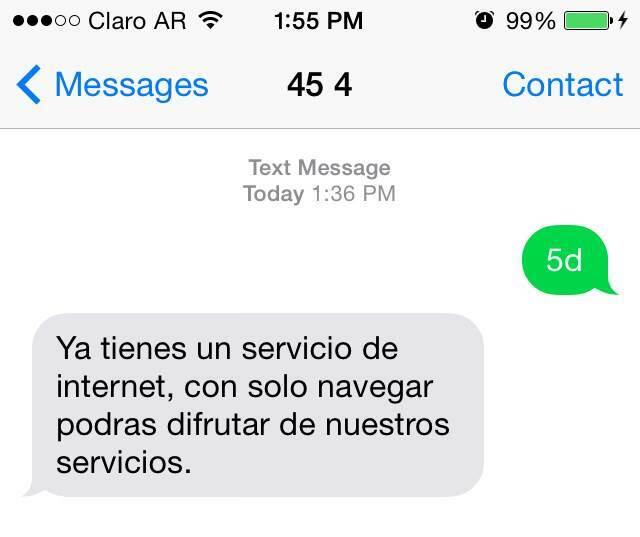 $2 serán descontados del crédito de la línea al conectarse a Internet. depending on what i’m reading online, the 2 peso TURBO to 252 is only good for 10 MB OR good for 24 hours. i just sent off a TURBO; we’ll see how long it lasts. the TURBO home page has very few details. update 2: yep, it only buys you 10 MB of full speed. i rummaged around on the Claro homepage and it didn’t seem like they had any sort of pack or upgrade for unlimited high speed. 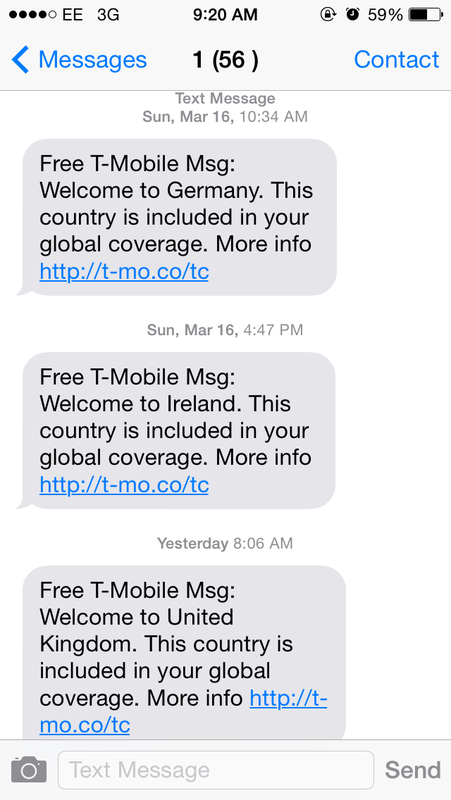 T-Mobile’s Unlimited International Data: YES PLEASE. 11 Comments on "Local SIM: Argentina Edition"
I recently signed up for the Simple Choice 500MB data plan (meant for tablets/hotspots) because of the time it takes to get a working local sim. Speed is a bit slow but usually latches to a carrier by the time I’m out of the airport (carry-on mostly) so I consider it a win. It might be worth the monthly cost and credit pull to you if you have enough non-usa trips planned. yes, i was thinking about doing that, too! i get my cell phone through work and we used to have unlimited international roaming via our business account with Verizon — but no longer as of about two years ago. i’m hoping the T-Mobile thing will spur them to bring that back. but yeah, i’ve definitely thought about this — especially since i have multi-country trips planned where it’s not worth the time to get a local SIM in each. I kept my Verizon mobile acct for domestic use since I’m also around the SF bay (south mostly) and Verizon reception is usually the best in my experience. The 500 MB data only plan (with free international sms & unlimited throttled data) is $17 a month with AAA (available to anyone) discount. The included free sms in Simple Choice is a nice benefit, too. Two factor auth often assumes you’ll always have access to sms… ;p.
nice! yeah i’m pretty pleased with verizon in the bay area, except when crossing either the San Mateo or the Dumbarton — i forget which, but every time i cross, i drop down to like 1 bar lol. is there a “you have to use your account mostly in the US” rule for the data-only plan? i heard there was something similar with their voice plan where they could cancel your account if you are primarily an international user? i didn’t know it was so cheap, though! for $17…great buy! I put my sim into a spare phone/tablet while home to register it to T-Mo’s network. $204/year vs local sims. A few quick stops for multi-country trips not supported by Toggle Mobile or Vodafone UK/IT Passes and it can really add up. Wish I had that grandfathered AT&T unlimited roaming plan. July 27th, 2015 I went to the same Personal store on Florida in Buenos Aries. It took me about an hour to get a sim card. You need a passport. The sim was a whole 10 pesos, 74 cents US. Then I ran into a problem. My old ATT phone that I thought was unlocked would not work. The cool thing was using Google translate to converse back and forth with the lady. I had to go to //www.att.com/deviceunlock/? and fill out the info. The next day I received a pin to unlock my phone. That worked good. I have not bought any credits yet as I have been traveling and busy with meetings. Today, after reading some reviews it seems like Claro has more data at faster speeds than Personal before throttling down. I am now in Neuquen and there is a Claro right up the street so I will go try them out tomorrow. When in BA I bought a Clara card from a Kiosk (before the Personal card) and it was 30 pesos, $2.22 USD so I just need some credits. I currently have Verizon and their international plan blows. 100 minutes and 1000 texts. My coworker has ATT and they have unlimited texts and more minutes. This article was very helpful for me, and I can confirm that much of it holds true in late 2015. I just got back from 2 weeks in Argentina, and it took a day and a half of fiddling to get my phone (HTC One M8)to actually work. Movistar sold me a SIM, but could never get it to work. I bought a SIM from Claro in the Palermo Mall, and while the voice worked right away, they told me that it would take a “couple of hours” for the data to work. 3 hours later, I went to a larger Claro store outside a mall, and one of their english speaking techs spent some time helping me out. First he had to add the APN for Clara.AR to the phone’s configuration (I had done this, but it wasn’t enough, and had removed it), then he had to put my phone in HSPA only mode (rather that global). Once that was done, data started working. Immediately. I do find it baffling that they cannot take payment for the prepaid data (4 pesos for 50MB/day) when they sell me the SIM. 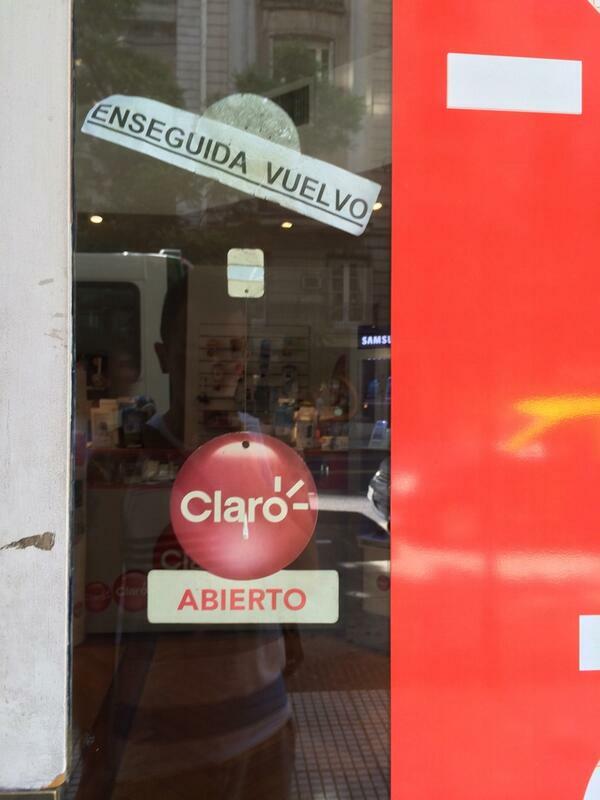 Note that the first Claro store did not try to set up the APN, nor did the Movistar store (probably why Movistar never worked). Thanks so much for the update! I’m glad you finally got it working but ugh, what a pain!